Eleven years ago I set up my first blog of sorts. It was hardcoded using Claris Home Page 3.0 and readers had no way to respond except via email. So it was not really a blog. It was a diary. Shao Ping and I did receive emails as a result of the site and consequently we made more friends in Singapore. It did not last long due to issues related to work. Not getting paid for 11 weeks or so at a time was one. Zero contributions to our retirement plan by our employer was another. I changed employers. But the Pasir Ris Mercury was never revived. That is all history now. Anyway, I named the site the Pasir Ris Mercury. Why? First of all, the name of the local paper in our home town was the Illawarra Mercury. Secondly, we lived in a town in the east of Singapore, named Pasir Ris. The Malay words “pasir ris” means white sands. We lived in Block 423, Pasir Ris Drive 6, just opposite Pasir Ris Park, and a short walk to the beach. It was a good spot. I eventually did set up a Blogger blog in January 2005, following repeated requests from my great friend in Singapore, Sivasothi. He is an educator extraordinaire and the pioneer of education social media. He predates all the big names in education blogging by many years. A true visionary. Check out Siva’s main site as well. I transferred that Blogger blog to WordPress in 2007 I think. It was a seamless integration with my main web site. Then, on January 1st, 2011 I established this new site. Entirely WordPress. No more html hard coding. I can publish directly from the phone. 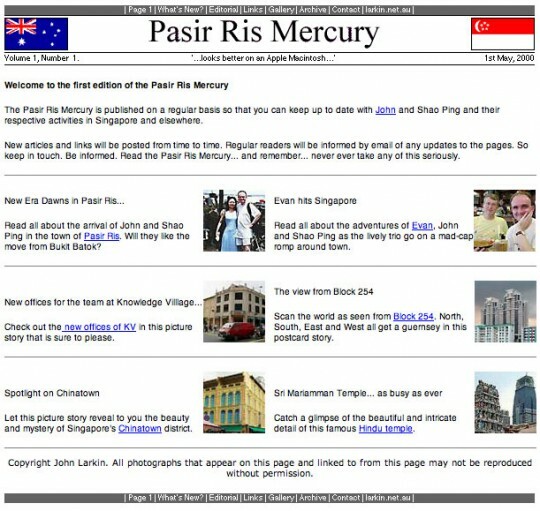 What I might to do now is resurrect those original Pasir Ris Mercury stories and republish them in an archival category on this site. What do you think? Methinks, why not? Do publish your old posts. They are invaluable social history resources. There is a whole new audience out there who weren’t reading blogs in 2000, 2005 or even 2007. Very good idea, republish! Great memories and with Singapore changing so fast, an important record too. Genius! Republishing your old posts is a must! Looking forward to more of your writings. Wow! It’s been 11 years of awesome writing then! I’m reading your past blogs here and I must say that you’re really gifted with words therefore republishing all your works is not optional. Way to go and wishing you another 11 years of awesome blogging. Learning a lot from you!